Portland journalist Casey Jarman is winning praise for his eclectic collection of interviews, including one with yours truly. Of all the conversations I’ve had amidst the current crest of death talk, the one I had with Casey stood out: wide-open, willing to wonder, curious, candid. 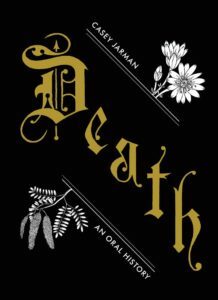 Death: An Oral History, available this month, is described by the usually restrained Publishers Weekly as a “profound collection of essays . . .Through Jarman’s discerning curation, interesting thought patterns emerge. Even those dealing with death professionally discuss it with remarkable candor and intimacy.” Read The Guardian review. Join me at Casey’s October 27 reading, Powell’s on Hawthorne, 7:30 pm. So I’ll share. Talking with Holly really sort of rattled me. I have always looked at cherished social conventions like weddings and funerals as old-fashioned relics. But I never spent much time thinking about what, if anything, they ought to be replaced with. That’s Holly’s line of work….Holly is clear-eyed about the need for ritual in our lives. I’ve been keenly aware of its absence since we talked. Order Death: An Oral History from your local independent bookseller, or come have Casey sign one for you at his October 27 reading, Powell’s on Hawthorne, 7:30 pm. I’ll be there. ← Nominations Open for 2017 Movie Selections! The Death Talk Project organizes workshops, rituals, Death Cafés, and other events. Join us for useful, honest conversation about how we die, how we mourn, and how we care for and remember our dead.